VAN DER AA - [Title page] Le Nouveau Theatre du Monde. VAN DER AA, P. - [Title page] Le Nouveau Theatre du Monde. [Title page] Le Nouveau Theatre du Monde. - VAN DER AA, P.
Title : [Title page] Le Nouveau Theatre du Monde.. Date : Leiden, ca. 1740. Size : 19.7 x 13.8 inches. / 50.0 x 35.0 cm. 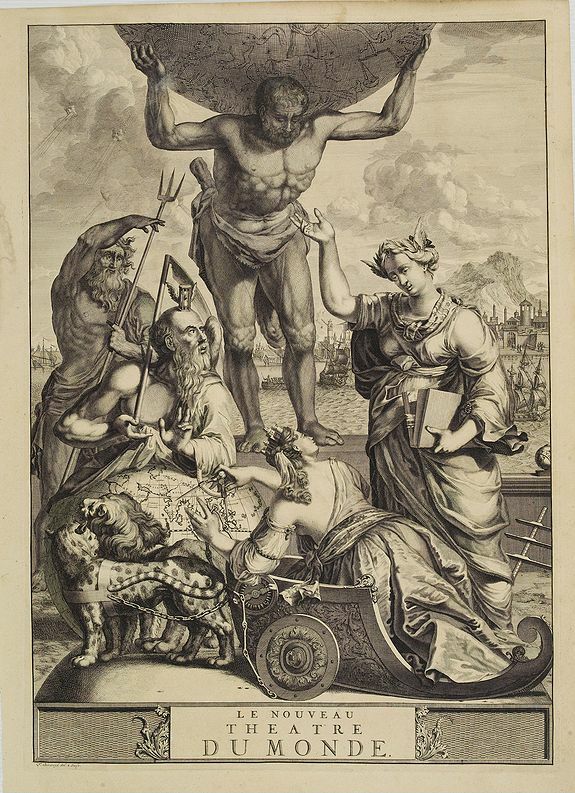 Description :The fine engraved frontispiece by F. Bleiswyk entitled "Le Nouveau Theatre du Monde" for Pieter van der AA. Shows Atlas carrying the world on his shoulders accompanied by Neptune, Zeus and other mythological figures. In lower left a globe showing the Far East region. Condition : Some light water staining on left margin. Dark impression.